How do I open a 7Z file? Open 7Z files with BitZipper! 7Z files are like the more well known ZIP files. They contain one or more files that have been compressed to reduce their size. 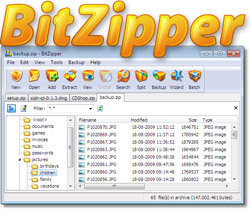 BitZipper will restore the files in your 7Z file to their original format. After installing BitZipper, you can open a 7Z file simply by double-clicking it, by right-clicking on it in Windows Explorer, or by starting BitZipper and opening the 7Z file the same way you open a document in your word processor. It really is very simple with the right tool. BitZipper is recognized as a leader in file compression, supporting a wide range of different file types, including 001, 7Z, ACE, ARC, ARJ, BH, BZIP2, BZ2, CAB, CHM, CHW, CPIO, DEB, DMG, DOC, ENC, EXE, GZ, GZIP, HFS, HXS, ISO, JAR, LHA, LZH, LZMA, MSI, PPT, RAR, RPM, TAR, TBZ, TGZ, TXZ, UU, UUE, WAR, WinRAR, WIM, XAR, XZ, XXE, XLS, Z, ZIP, ZIPX, ZOO - with more to come!